The report of Lieutenant General Carlos Alberto dos Santos Cruz—the Cruz Report—asks important and ambitious questions: what explains the spike of UN peacekeeping casualties in recent years and what can be done to reduce them? Many recommendations it provides are interesting. Its principal policy conclusion, however, that a “strong posture will reduce casualties” (p.12) lacks scientific rigor. Prior contributions to this series on the Cruz Report have focused on the political aspects of the study. My strength is in statistics. Over the past years, I have been studying and publishing on UN fatality trends. My current research project tries to assess the myriad of factors that impact why UN peacekeepers die, among which rank UN mandates. To precisely assess their impact, I coded 75 UN operations for the type of mandate they were tasked to implement by the UN Security Council. Category 1 mandates, the baseline category for this statistical analysis, include traditional peacekeeping missions. These missions focus primarily on monitoring truces and peace treaties using a combination of military and diplomatic means. Missions that fall into this category are, for example, the United Nations Observer Mission in Georgia (UNOMIG) or the United Nations Iraq-Kuwait Observation Mission (UNIKOM). Category 2 mandates comprise “specialized missions” focusing on a circumscribed set of tasks (e.g., political missions, observation of elections, or security sector reform). The United Nations Assistance Mission in Afghanistan (UNAMA) or the United Nations Mission in East Timor (UNAMET) fall into this category. Category 3 mandates are “multidimensional missions,” which I characterize as complex civil–military peace operations in which, however, the sovereignty of the local government is retained. Missions of this kind include the United Nations Integrated Office in Burundi (BINUB), United Nations Mission in the Central African Republic (MINURCA), or the United Nations Mission for the Referendum in Western Sahara (MINURSO). Category 4 mandates are “regular” peace enforcement operations. The United Nations Mission in Sierra Leone (UNAMSIL) or United Nations Mission in Liberia (UNMIL) are included here. And finally, Category 5 mandates comprise “robust” enforcement operations—those in which the strongest force postures have been used thus far. Only the United Nations Stabilization Mission in the Democratic Republic of the Congo (MONUSCO), the United Nations Multidimensional Integrated Stabilization Mission in Mali (MINUSMA), the United Nations Operation in Somalia II (UNOSOM II), and the United Nations Multidimensional Integrated Stabilization Mission in the Central African Republic (MINUSCA) fall into this latter category. To calculate how these different types of mandates impact the probability of UN fatalities due to hostile acts (i.e., malicious acts), I run statistical regressions using a dataset I collected on UN fatalities (codebook and data). The dataset allows me to examine the impact of these mandates on all UN fatalities—including troops, police, observers, and national and local staff—and only UN troop fatalities by contingent, mission, and month. Moreover, I can control for the size of the mission, the year the mission deployed, and a rage of time-invariant UN contingent related variables (i.e., level of training, quality of equipment, strategic mindset, and medical care at the contingent level). The results of the analysis are quite staggering (see graphs below). Compared to the baseline, a robust peace enforcement mandate increases the probability of a UN troop fatality due to hostile acts by 13% per contingent/month. If all UN fatalities are included in the analysis—troop, police, observer, local and international staff— this number rises to 15%. 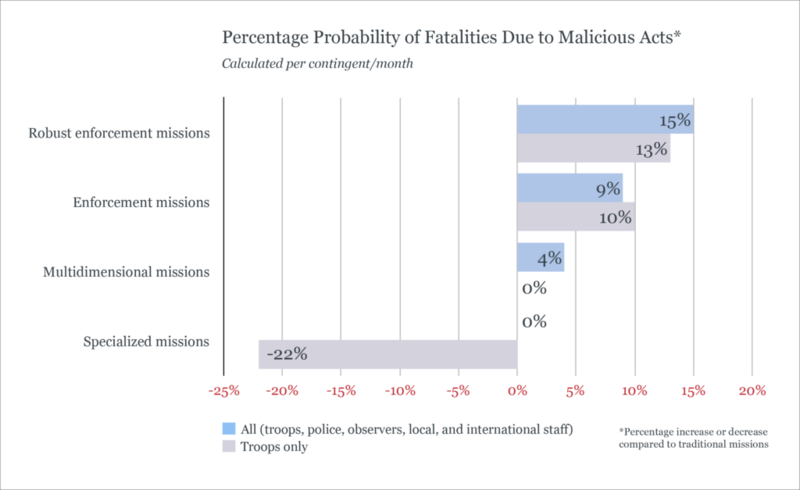 Regular enforcement operations account for an increase of 10% (troops only) and 9% (all UN personnel), multidimensional missions for an increase of 4% (all UN personnel, no statically significant result for troops only) and specialized missions reduce such fatalities by 22% (troops only, no statically significant result for all UN personnel). The results are even more sizeable for fatalities from African UN contingents, which have contributed most of the troops to robust enforcement operations in recent years. 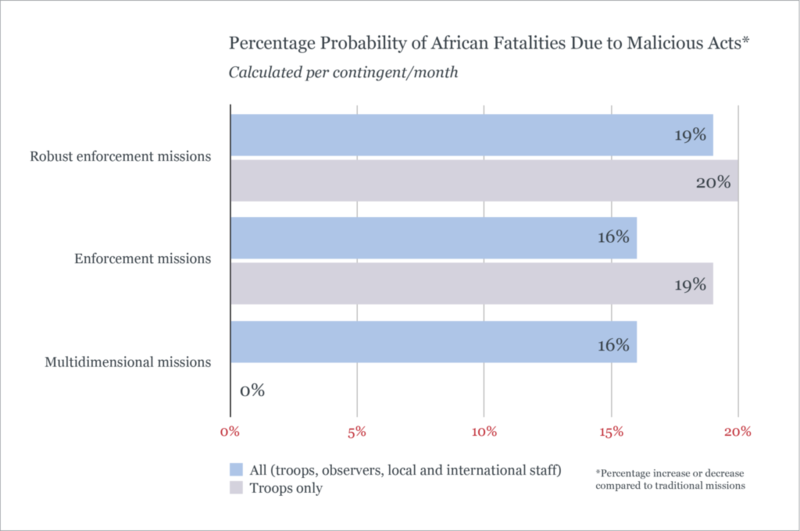 Compared to the baseline category, such robust peace enforcement mandates increase the probability of an African troop fatality due to hostile acts by 20% per contingent/month and of any African fatality by 19%. Regular peace enforcement operations increase such probability by 16% for all African UN personnel and 19% for African troops, and multidimensional operations by 16% for all African UN personnel. What do these results suggest? First, UN fatalities occur due to a range of reasons—mandates arguably cannot account for all of these factors. Nevertheless, these results still require us to pause and think carefully about a call to use even “more robust” mandates in the future—as the Cruz Report recommends. The data certainly does not confirm that a strong UN posture will necessarily reduce casualties. To the contrary, thus far more complex and robust mandates are correlated with an increase in UN fatalities. This increase is especially pronounced for African UN contingents. Second, one could, of course, reason that not enough force has been used in robust peace enforcement operations such as MINUSMA, MONUSCO, UNOSOM II, and MINUSCA and it is this “lack of robustness” which accounts for the high number of fatalities in these operations compared to other types of operations. Such hypothetical reasoning cannot be tested with the data I have. However, prior to suggesting that “more force” is the most efficient solution to reducing UN fatalities in these operations, the statistical findings certainly propose that other policy options also need to be taken into account, such as the strategic and political context in which the operation is embedded. Moreover, UN operations with more circumscribed and tailored mandates have certainly fared much better in the past—at least with regards to UN fatalities—than complex, ambitious, and “robust” operations. Marina E. Henke is an Assistant Professor at Northwestern University. Her research focuses on military interventions, UN peacekeeping, and European security and defense policy. The statistical analysis uses fixed effects by UN contingent. The analysis, however, does not take into account conflict level dynamics (e.g., rebel advances). Please contact author for greater detail. This article is part of a series being published in February by the Global Observatory on the report of Lieutenant General Carlos Alberto dos Santos Cruz on peacekeeping fatalities and injuries. The Cruz report comes amid a broader strategic review of peacekeeping missions, focused on how the UN can adapt to the changing nature of conflict.